In addition to this article, please see my newer article from my second vacation to Orlando in 2016. This is a blog, in large part, about kosher vacations with kosher food and minyanim. Please also look at our other articles on other places to find kosher vacations. Orlando, Florida is a great vacation destination for the simple reason that a) there are lots of inexpensive flights there from the rest of the country, b) the hotels are comparatively inexpensive, c) you can find a minyan and kosher food the whole year, and d) there’s tons of family-friendly entertainment. The story behind the creation of Disney World is an interesting one, but suffice to say, it’s massive and overwhelming. 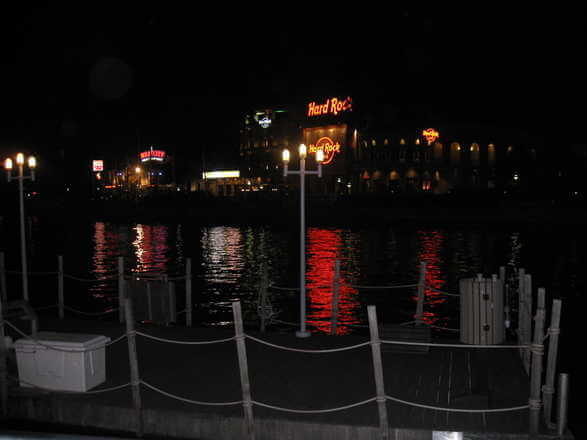 Beyond Disney World, there’s Universal Studios, SeaWorld, and a variety of other places. First, there is a regular minyan run by the Chabad of Orlando very close to Universal Studios and SeaWorld. For Schachris, there is generally an 8am minyan but during yeshiva week break and other times, they add a 7am minyan. (Even better, if you go during yeshiva week break, the parks are at about 1/4 capacity since the rest of the country’s kids are in school – no lines anywhere!). They also have a zman minchah and maariv minyan. Keep in mind that this regular minyan is about a 1/2 hour drive from Disney World, so you’re probably better off staying in a hotel near the minyan and driving to Disney World on the days you visit there if you’re serious about, you know, davening with a minyan. Again, however, it is very close to Universal and SeaWorld. Next, at Disney World parks, generally speaking, at some major landmark you can find a minchah minyan near the end of the day. At the Magic Kingdom, the minyan generally takes places behind the castle. At Epcot, it’s near the entrance. When I was there, three of us decided we’d have a minyan at the large fountain at 2pm so we simply told everyone with a yarmulke we passed that there’d be a minyan. Something like 50 people showed up. The only ‘real’ restaurant with kosher food is at the Chabad of Orlando. In a strip mall, you’ll find not only the weekday minyanim, but also their restaurant. A 5-star restaurant it is not, but the place is called “kosher gourmet restaurant” after all. The place was very overwhelmed handling the crowds when we were there on a very busy week, but if you want hot food without cooking, this is where to go. It has hotdogs, hamburgers, and the like. Some of the local supermarkets have foods with hecsherim (certified kosher), but none that we could find had any real kosher section with kosher meat and cheese. If tuna is your thing, then no problem. A truck comes around to the Chabad on Thursday nights which sells packaged kosher food off the truck for people ahead of Shabbos, but check with them when it will be there. You can get a warm, double-wrapper kosher meal at any Disney park in Orlando. 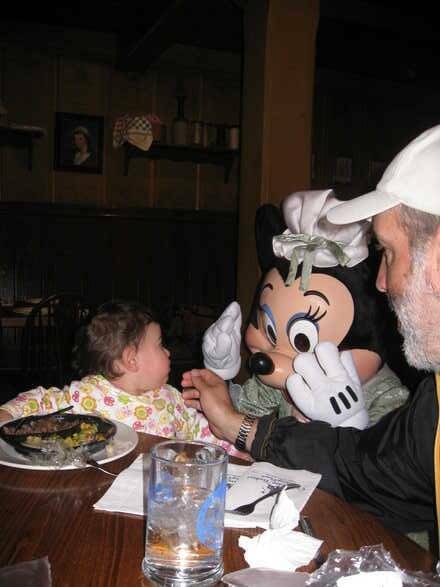 There are two choices: 1) each park has a designated restaurant with kosher food where you can order on the spot; 2) by calling two days in advance to 404-WDW-DINE, you can have your meals waiting for you at ANY restaurant within Disney World. The meals were the exact same using either option and are certified by the same Miami kashrus agency that certifies food for for cruise lines. You have your choice of steak, chicken, vegetarian, and choices of this nature, and the food is above airplane food quality, but not too much above it. The price is much higher when having it delivered to the restaurant of your choice (something like $22/meal instead of $12/meal. So why have kosher food delivered to a restaurant other than the designated one with kosher food at Disney? There are a few reasons why you might do this – 1) you might want to eat in a nicer restaurant with waitress service, 2) some of the restaurants are ‘character’ restaurants where Daffy Duck, Chip the chipmunk, and whomever else comes around to your table. We did it once, but given the extra expense and the same food, I wouldn’t recommend doing it more than once. There are all sorts of websites explaining all things to do in Orlando, but we’ll just highlight some of the places we visited, and their appropriateness for frum families. Magic Kingdom – best for ages 3 until about 9. This is the first Disney park and most ‘classic’ one with the famous Disney castle. They use tricks like slowly having the ground slope unnoticeable upwards to make the castle look bigger than it is, but the main attractions are more of the rides, many of which are slowly moving cars on tracks in the water so children of any age can go on them. Our kids’ favorite was Test Track, a combination quasi-roller coaster and plot line where you’re the test dummy. Magic Kingdom is largely a cutesy, idealized fantasy world which can easily morph into sensory overload. You can spend a full day here and not do everything there is to do. 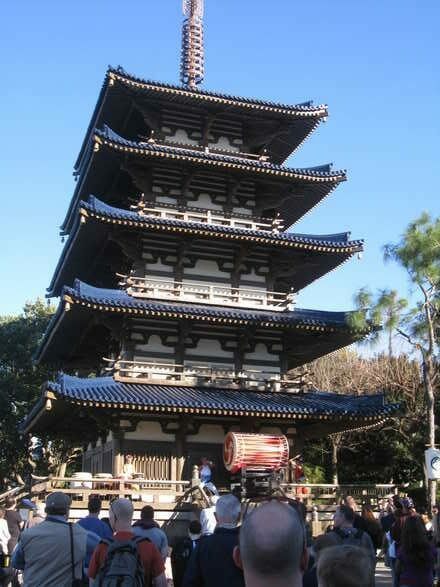 Epcot Center – best for ages 5 until about 13; also fun for many older kids and adults. The main feature here, in our opinion, are the different sections for various countries. You can see a 9-screen movie about Canada, for example, where the guides dress tzniously with long skirts and black/red checkered shirts, something like a mounty … we think. Universal Studios – best for ages 9 until 18; also fun for many adults. If Dinsey World is a G-rated cartoon, then Universal Studios would be a PG-13 movie. It’s themes are based on movies . . . from Universal. There’s also some roller coasters and things of that type, and a “City Walk” which is mostly bars and t-shirt sales. SeaWorld – best for all ages. 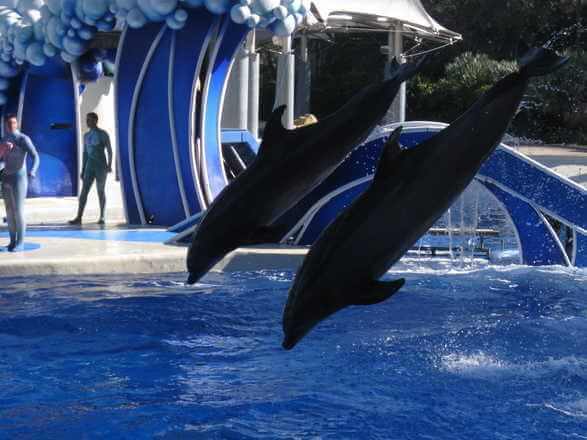 We love SeaWorld. You can’t find kosher food there (well, except in tanks that you can’t get to), but you can find lots of shows. 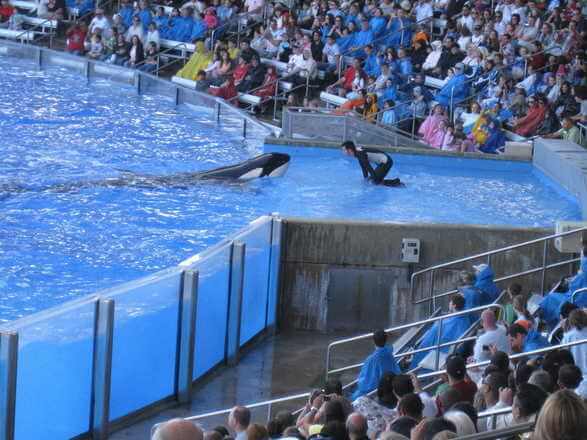 You can spend the day going from show to show with their major show being the killer whale show in their largest tank. They usually have this show once at mid day and once near the end of the day. There’s also the dolphin show, the jet ski act and others. The performers are mostly wearing wet-suits and are, at least, completely covered. In between shows there are a large variety of aquatic life and some rides for varying ages from the flume to the full-sized roller coaster. 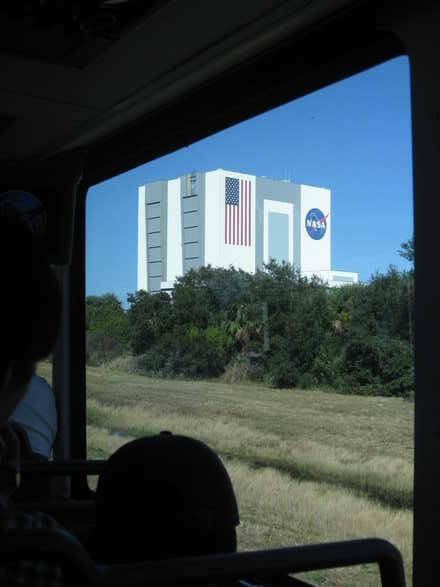 Typical of the Kennedy Space Center tour – looking at a large building, from a distance, in a bus. Kennedy Space Center – best for ages 6 until 13 maybe. Honestly, we weren’t really that impressed with it. There’s an “astronaut hall of fame” which isn’t very interactive . . . mostly you look at lunar modules and that sort of thing. There’s also a bus tour where you get driven around the rather huge NASA facility in Cape Canaveral. You just sort of see big man made space shuttles, rockets, and buildings, sometimes from large distances and between very long drives – this gets old very quickly. It’s also about an hour’s drive from Orlando. Medival Times – best for ages 5 until 17. They have a few of these around the country, including in New Jersey just outside Manhattan. You can get kosher food, but the entertainment isn’t so kosher. It’s a fake jousting show on horses about bravery through physical might and eating like a pig (we bring this up to highlight the middos [character of the event], not the kashrus, though don’t worry, the food isn’t kosher either). You can get kosher food, but it won’t kasher the entertainment. On the other hand, there’s a Tosafos (Succos 45a) [commentary on the Talmud] describing what seemed to be a common practice of having actual jousting at Jewish weddings. Orlando Mall – best for adults (… ever hear the Marevlous Middos song, “Never take your kids to a store”?). 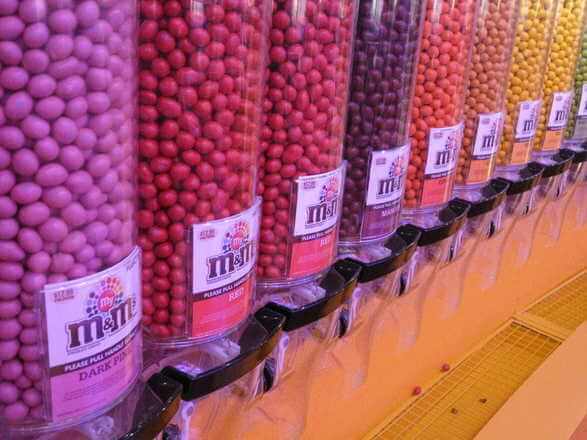 The mall in Orlando has a lot of touristy things, like an M&M store where you can pick by color and get any M&M-related paraphernalia you ever heard of. M&M’s are all kosher (OU-D), too. I am a conservative Jewish woman, living in the Orlando area, and I keep kosher. I am curious to know – If there were a small house available for short term rentals with a kosher kitchen stocked with the kosher foods of your choice, would this be something that people would choose, rather than to stay at a resort? I am thinking about buying a property for this express purpose. I would even have a hot kosher shabbos meal ready and waiting for you when you returned from a day in the parks on Friday evenings, complete with my (if I may say) fabulous home made challahs! Yes! Very much so – because kosher food in Orlando is quite limited. I just went back there last week and we more or less brought most of our food and got the rest at Publix. We rented a house too… see my next two posts upcoming! One is going to be an Orlando update and the other about house rentals on vacation. Home made stuff might run into problems though. In order for it to be accepted by the vast majority of kosher-seeking consumers, you would be need supervision from an acceptable kashrus organization like the O-U, O-K, Star-K, Chof-K or one of the local vaad’s in Florida. You’re probably best off just advertising that you stock the house with kosher only products, have two kitchens with easily kashirable items (e.g. metal-only pots, self cleaning oven) and leave it up to the traveler to kasher the pots. That, I’d feel comfortable with and would be worth a premium over what I paid for my house rental. You might also reach out to others who do similar sorts of things … check out Happy Harris on Hunter, NY and the “Kosher” Bed and Breakfast in Newport, RI. I have blog articles on both here. The former (Hunter) is fully kosher, certified, and cooks individual meals for everyone. The latter (Newport) is more what I think you have in mind and what I’d call “kosher and Shabbos friendly”. we will be staying in the all star Music resort from the 23 july to the 4 of august I need a minyan, do you know where can I find one near?? Just a note, Our family will be at the All Star Music Resort starting December 3, 4 5. We will be having a Chanukah shacharit minyan with a Torah in the morning at the hotel. The front desk will know where we are.